WASHINGTON, D.C. — Vice President Mike Pence is pushing back for the first time against recent criticism from fellow Hoosier — and likely Democratic presidential candidate — Pete Buttigieg. The South Bend mayor invoked the name of the former Indiana governor during a speech last weekend at the LGBTQ Victory Fund in Washington, D.C.
"And that's the thing I wish the Mike Pences of the world would understand: That if you've got a problem with who I am, your problem is not with me. Your quarrel, sir, is with my creator," Buttigieg said. 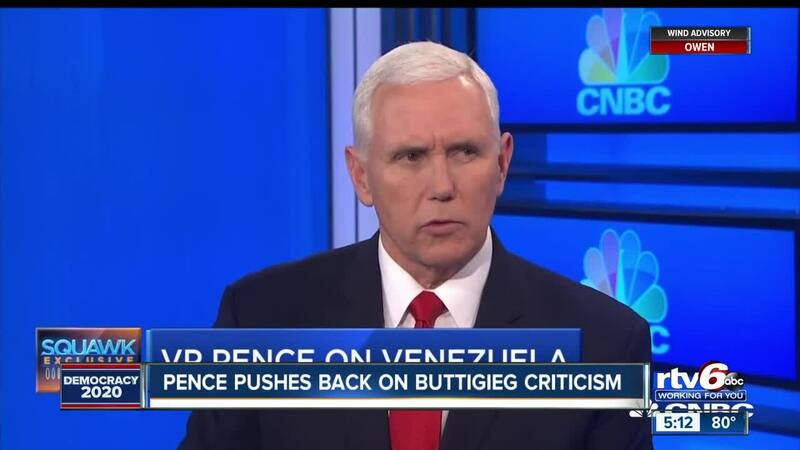 During an interview on CNBC Thursday, Pence was asked about Buttigieg. He echoed some what of Buttigieg has said about the two having a cordial working relationship while Pence was governor, but Pence also took issue with the mayor. "He said some things critical of my Christian faith and about me personally, and he knows better. He knows better," Pence said. "But I get it. They got 19 people running for president on that side in a party that's sliding off to the left." Buttigieg has said his decision to come out as gay was influenced by Vice President Pence's signing of the Religious Freedom Restoration Act when Pence was governor. The law was changed after critics said it could be used to discriminate against the LGBTQ community. Buttigieg will hold an announcement Monday in South Bend when most expect he will announce he's running for president.